In four years, Instagram has gone from having one million to over 150 million users. The app’s reach as a platform for sharing photos is incredible, but for many, the value of what’s posted maxes out at a number of likes. The lack of commercial opportunity for a new class of mobile photographers led Newell, a veteran of the stock image industry, to create a startup for buying and selling photography called Snapwire. Think of it like 99designs and 500px combined with Shutterstock. While still in its early days, Snapwire is already drawing big-name advertisers to its growing of library premium stock photography. And it’s filling that library with the kinds of shots you would normally see in your Instagram feed. 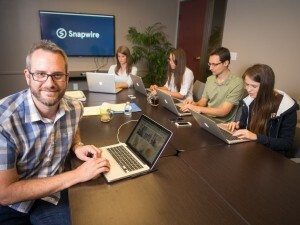 Newell (left) with the Snapwire team. Newell has been in the stock photography business for 16 years. His career started with Media Bakery, a resource that offers millions of stock photos. When Instagram was in its infancy six years ago, he saw a new opportunity. While many used Instagram to share over-flitered pictures of their lunches and lattes, there was a group of creatives using it to share beautiful, striking photography with a distinct look. A photographer who shoots primarily for Instagram has an authentic aesthetic that feels more real than what you normally see on a billboard or magazine ad. As Instagram’s popularity started to rise, the staged, whitewashed look of traditional stock imagery was starting to go out of style too. Buyers were wanting a “photo that didn’t look like a stock photo,” and suddenly there was a wellspring of original photography being shared for the world to see that fit the bill. “We all take a picture on our camera phone at one point and say, ‘Hey, I wonder if that’s got what it takes? '” says Newell in a phone interview with Cult of Mac. He knew that there were Instagrammers who had what it took, and in October of 2012, a prototype of Snapwire was shown to select photographers he admired. The big challenge then was that it was 2012, and smartphone cameras weren’t quite good enough to meet the print needs of bigger buyers. Snapwire was kept quiet in private beta until after Apple unveiled the iPhone 5s in the fall of 2013. The camera in the 5s was far better than any other smartphone on the market, and it showed how committed Apple was to keeping its hardware on the cutting edge of mobile photography. Newell knew it was time to show Snapwire to the world. 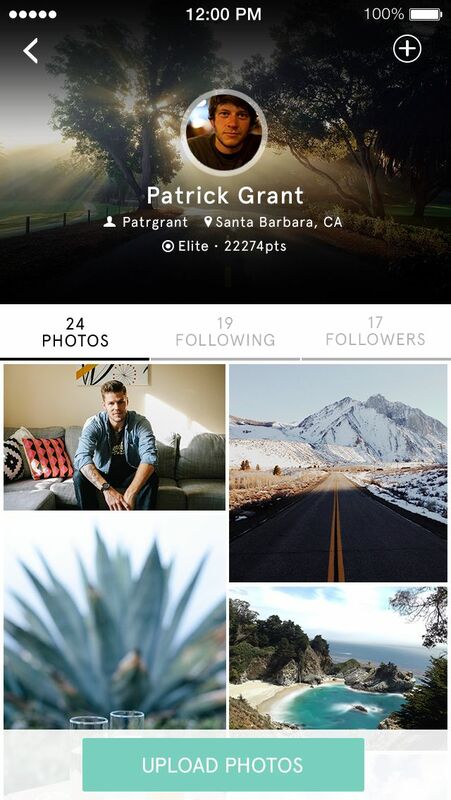 Based in beautiful Santa Barbara, California, Newell and his small team brought Snapwire out of private beta in March. Previously designed as a curated library for buyers to peruse, Snapwire evolved into more of a request platform, like TaskRabbit for photos. Newell calls Snapwire’s user base “an army of mobile photographers that responds in real time.” The key to Snapwire is its custom-request platform that allows buyers to explain what they need, offer a price, and put a deadline on submissions. Photographers on Snapwire can see these requests and make submissions with photos they take on their phones or DSLRs. When work is bought, the photographer keeps 70% of the licensing fees paid by the buyer and Snapwire gets the rest. Snapwire funds conceptual challenges alongside buyer requests as a way to help its users learn about the current market demand for stock imagery. $10-$250 challenges based around themes like “farm to table,” or “children at play” are common to find. Snapwire has also been promoting popular editing tools for the iPhone with challenges for the best use of VSCOCam and an upcoming challenge for using Litely by Cole Rise. 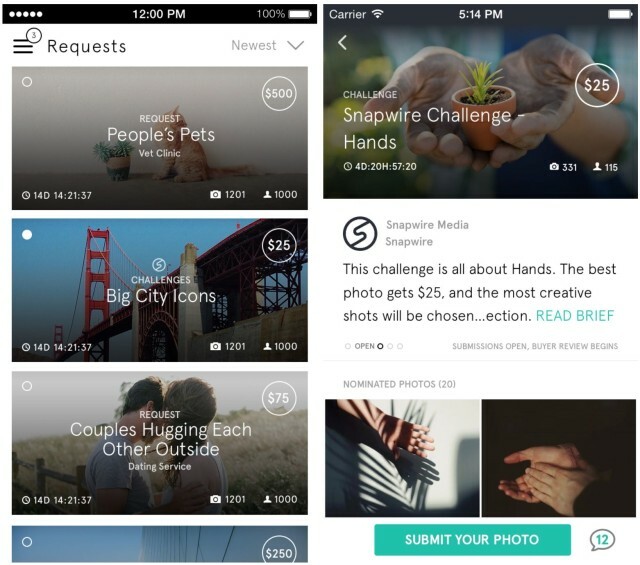 Explorers can only submit to Snapwire’s concept challenges while Shooters can submit to buyer requests. You become “Advanced” when a buyer purchases one of your photos, and from there you can level up more to get additional perks, including a placement on Snapwire’s leaderboard. For buyers, pricing can start as small as $7 and go up to $10,000 requests. Snapwire has attracted some big-name buyers already like Dennys, Marriot and even some of the biggest creative agencies in the world like JWT and Omnicom Group. It’s also popular with small bloggers and graphic designers who just need a stock image for an article or design. 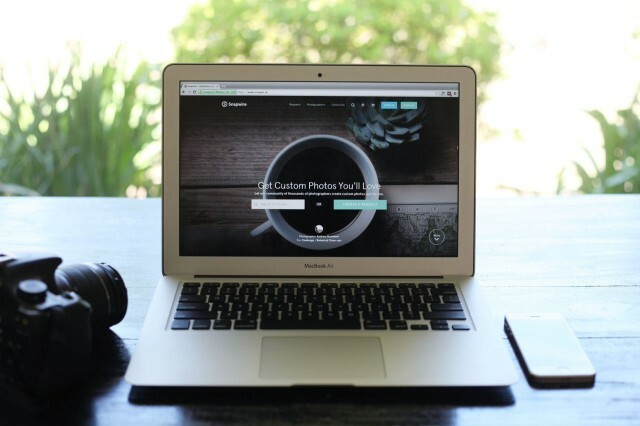 Everything uploaded to your Snapwire portfolio can be bought. Newell believes that his team’s history in the stock photography industry gives them a leg up in terms of building relationships with buyers. They know how the system works. 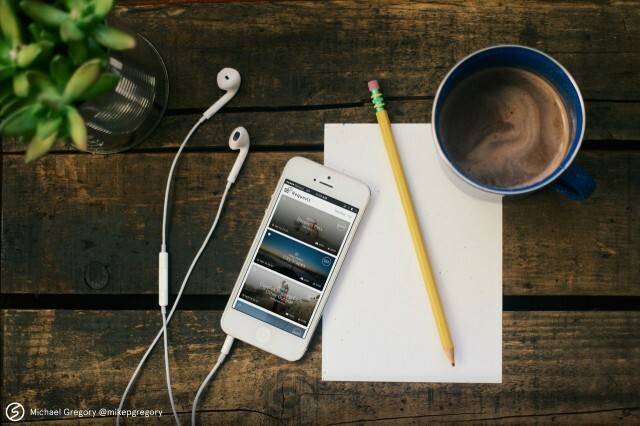 Snapwire has been designed to make it easy for photographers to show off good work and meet the buyer’s needs. “All of these mobile photographers, whom are very talented at what they’re doing, have no expectations or knowledge-base as to how to earn money from their photography beyond the lucky call that they may get,” explains Newell. About 60% of photos on Snapwire are shot with a smartphone and 40% with a DSLR, according to Newell. The ratio makes sense given that the iPhone is the most popular camera in the world. Thanks to the evolution of smartphone cameras, more people are able to take quality photographs than at any other time in history. The trend is clear. Flickr recently announced that it would help license its users’ photos to be sold commercially. Snapwire seems to be in a better position than anyone else for capitalizing on the itch mobile photographers now have to make money off their work. Newell believes that more and more people will want to start selling what they post on Instagram. “It’s the ultimate ego-valuation,” he says.